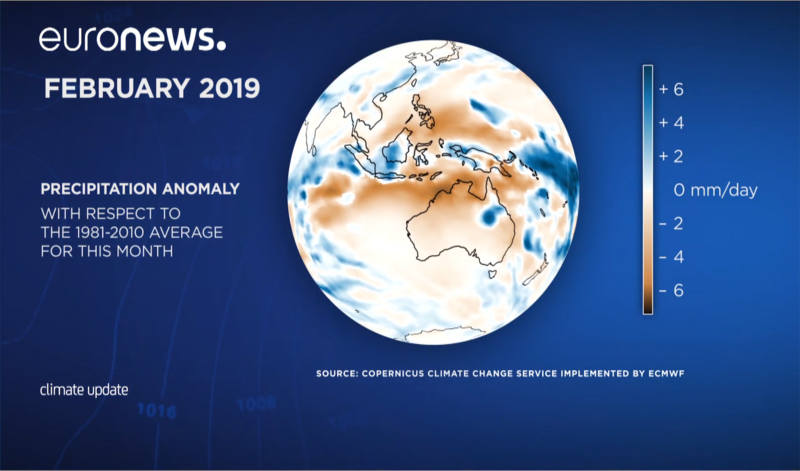 Copernicus released its February 2019 Climate update. In February the global temperature was well above average. Conditions in the US notably California were quite wet while the southern hemisphere was generally drier than average. Queensland in Australia was the exception after rain led to large-scale flooding. In Europe, February began with lower than average temperatures. Heavy snowfall in Bosnia resulted in severe flooding and landslides. By the end of the month, conditions were dry and extremely warm for the time of year. France, Spain and Romania all saw wildfires. Sea ice is decreasing globally especially in the Arctic. In the Antarctic, there is no such trend though sea ice for February has been below average for the last four years. You can find full version of the article published by Copernicus Atmosphere Monitoring Service here. Global temperatures are not "well above average". 0.34 C and falling. Get onboard with science not politics. The science doesn’t support what is happening to clouds now. The bugs and birds are still more accurate than most tv weather reporters at predicting rain. Now it's "CLIMATE CHANGE" we don't call anymore "GLOBAL WARMING"
This is similar weather to what was happening 50 to 60 years ago and the sun is presently in a deep solar minimum. So naturally the climate will change as it has done since the solar system began. Remember in the past the planet had higher and lower temperatures than what we are experiencing now. Also the CO2 levels have been higher and lower in the past. Remove CO2 from the atmosphere and the planet dies. Read the real science not the corrupted science. Previous commentators - engage with the report. Dismissing it out of hand is not science. Cyber Weather - Could you please list the source of your claim that global temperatures are 0.34 C above normal and falling. For the month of Feb this report has 1.2 C above pre-industrial average. It’s so bad, all the rich people are giving up their private jets, lol.